Andreas Boyde, was born in 1967 in Oschatz/Saxony and studied the piano in Dresden and London. He has appeared as a soloist with renowned orchestras such as the London Philharmonic Orchestra, the Sächsische Staatskapelle Dresden, the Malaysian Philharmonic Orchestra, the Prague Radio Orchestra, the Auckland Philharmonia Orchestra, the Bamberg Symphony Orchestra, the Hallé Orchestra Manchester, the Bolshoi Symphony Orchestra and the London Mozart Players. Boyde’s repertoire comprises key works from all periods, also including contemporary composers such as Paul Schoenfield and John Pickard. 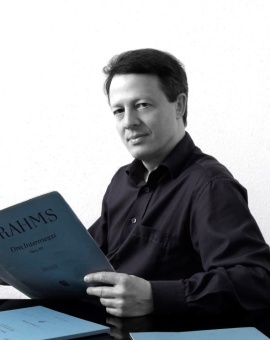 Boyde has recorded Brahms’s complete solo piano works with OehmsClassics, a co-production with the WDR.